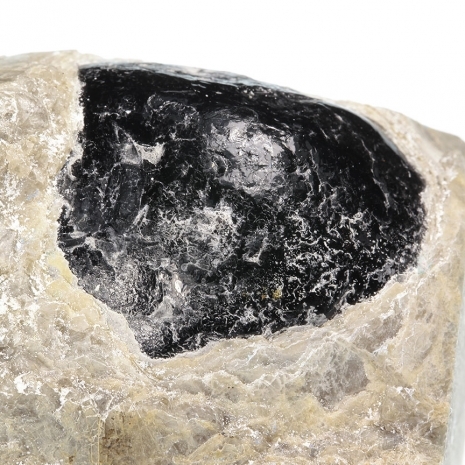 Comment: Mindat.org defines Apache Tears as a "variety of obsidian wherein the obsidian formed small droplet-shaped, spherical, or biscuit-shaped masses after being volcanically ejected and cooling as it passed through the atmosphere". These are essentially volcanic glass, but they're not opaque as they might appear on the exterior, they actually resemble Smoky Quartz when backlit. One of the most famous localities for the material is Picketpost Mountain area, near Superior, Arizona. This piece is a classic example of this beloved material from the American southwest, but the most important aspect of the piece is the fact that it's actually ON MATRIX, which is rare in my experience with the material. 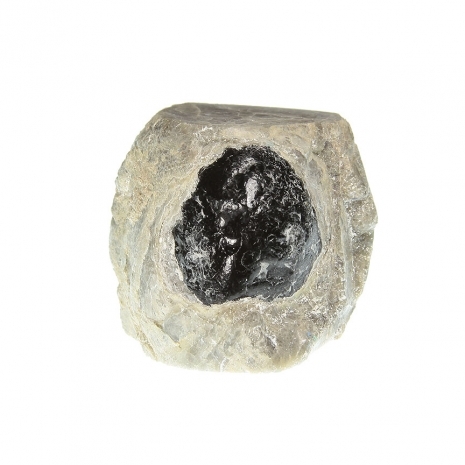 The actual obsidian "orb" measures 2.5 cm across. From Wikipedia: "The name "Apache tear" comes from a legend of the Apache tribe: about 75 Apaches and the US Cavalry fought on a mountain overlooking what is now Superior, Arizona in the 1870s. Facing defeat, the outnumbered Apache warriors rode their horses off the mountain to their deaths rather than be killed. The wives and families of the warriors cried when they heard of the tragedy; their tears turned into stone upon hitting the ground."